China says it is considering ending a controversial residency permit system that makes a legal distinction between urban and rural residents. The idea is being studied by 11 Chinese provinces, according to the state-run China Daily newspaper. The proposed reform would give migrants to the nation's fast-expanding cities the same health, education and security rights as people born there. Analysts say the move is an attempt to address China's growing wealth gap. Tens of millions of rural migrants have already moved to some of China's largest cities in search of work. According to the Xinhua news agency, there were about 87 million people living in areas where they did not have permanent residency rights by June this year - a figure many analysts consider to be a conservative estimate. These migrants are eager to work and send money back to their poverty-stricken families - and play an essential part in the booming construction industry in China's cities. The current residency permit system, which has operated for decades, denies these migrants access to services which are an automatic right to native city dwellers. Many migrants also suffer from unfair treatment, including the denial of payment, as employers feel they can take advantage of the incomers' different legal status. China's authorities are becoming increasingly concerned about the growing gap between the urban rich and the rural poor - and anxious that it could lead to social instability. The residency proposals are just one of a number of measures China has recently put forward to try to reduce this discrepancy. 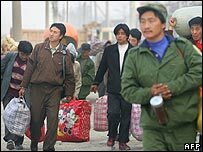 But according to the China Daily, public security experts have warned that rapid changes to the residency system could lead to social chaos and soaring crime, as a huge influx of rural migrants might flock to the cities. The China Youth Daily, though, disputed this view. "In today's China, many urban ills are not results of opening residency restrictions, they come from migrants being treated unequally once they enter cities," the newspaper said. According to the China Daily, a previous attempt to abolish residency permits - made by the city of Zhengzhou in 2001 - had to be abandoned. Zhengzhou, the capital of Henan province, offered free permanent permits to people with relatives already living in the city. But the increased pressure on public services and the large rise in crime forced the authorities to reverse the measure in 2004. Of the 11 provinces reported to be considering scrapping the residency regulations, most are coastal provinces which are magnets for migrants from the rural hinterland. According to Chinese media, one of the provinces studying the idea is Guangdong, across the border from Hong Kong. A quarter of Guangdong's population is already made up of migrant workers, according to some estimates, but the city's authorities still say they face a serious labour shortage. China's two largest cities, Shanghai and Beijing, are not included in the proposals.